This week we are going to be posting Quick and Easy Crochet patterns we have found or created. Today I am posting a Baby Neck Tie Pattern. I made two of them and it took me less than 2 1/2 hours from start to finish, including time outs to reply to texts and emails lol! 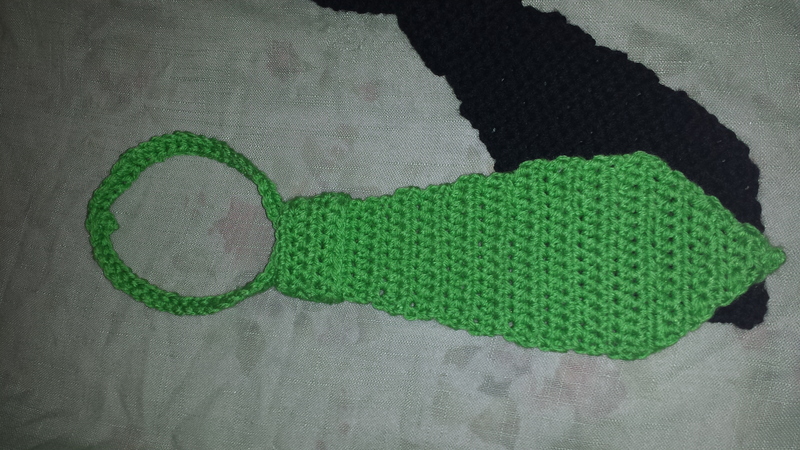 This is a very simple pattern, worked in half double crochet stitch. 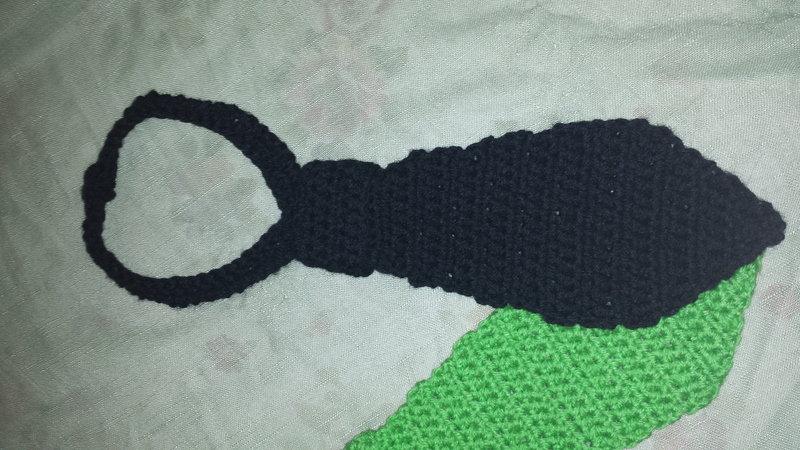 I originally tried doing it in single crochet but it looked too holey for my liking so I reverted to the HDC. 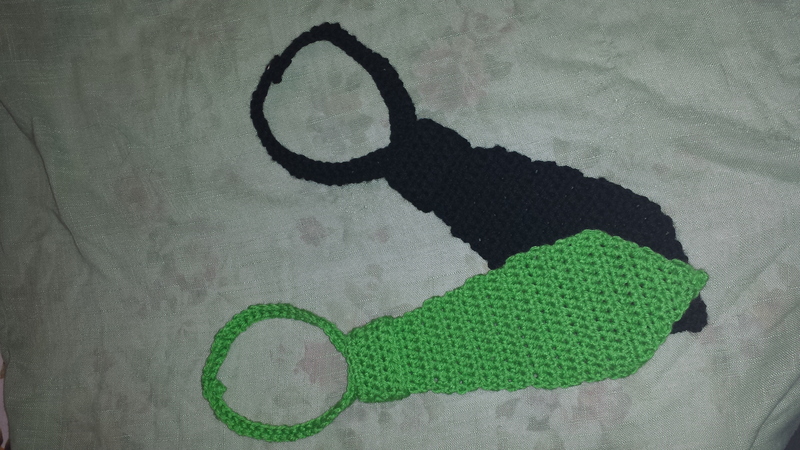 I just made them in a worsted weight yarn and a size 5 crochet hook, one in black for formal occasions and the other in a bright green for not so formal occasions lol! Finished the tie itself is about 9″ long. Just a note, while I was crocheting this I was listening to my 8 lb. cat Lulu snoring like a drunk lumberjack…. really, she is that bad lol… and my mind started to wander to the possibility of making even smaller versions of these for cats… and maybe dogs too. I will update with pictures if I actually follow through on this! Round 2 – dc in 3rd chain from hook, continue to end of chain. Round 3 – 2 hdc in first st, hdc until you reach the last st, 2 hdc last st. Round 7 – 2 hdc in first st, hdc until you reach the last st, 2 hdc last st. Round 11 – 2 hdc in first st, hdc until you reach the last st, 2 hdc last st. Round 15 – 2 hdc in first st, hdc until you reach the last st, 2 hdc last st. Round 21 to end – Hdc decrease first 2 st together, hdc across until last 2 st, hdc decrease last 2 st together. Continue in this manner until only one st remains. Knot off last stitch. Round 5 – 2 Hdc in first st, hdc next 16 st, 2 hdc in last st.
Fasten off, weave in ends and sew on to tie. Sew button to one end of next portion and use one hdc space as button hole. This entry was posted in Crafts, crocheting, Our Posts and tagged baby neck tie pattern, crochet baby gift, crocheting, easy crochet pattern, postaday. Bookmark the permalink. They would have to be tiny! It would drag in the mud and get caught on things. Are you making it so it pops open if that happens? Just brings to mind a cat of ours. He had one of those elasticised collars with a bell on it to warn off birds. He must have got it caught somewhere and instead of slipping off it got stuck around his mouth so he couldn’t eat or drink properly. As he was a wanderer he often didn’t come home for days. Poor thing was not in good shape when he did 😦 I still feel bad about it. I never put a collar on any cat after that! Wow. Poor cat! And yes, I think I’m going to use velcro as the fastener. 😳 I had to read your comment twice. I saw the “dragging through the mud” part and started wondering what exactly other people do with their babies! Please trash one of them! It would have to be tiny. Otherwise it will drag in the mud. And for cats especially it would have to slip open easily if it catches on anything. I still shudder in horror when a cat of ours came home with its elasticised collar which had obviously got caught on something, slipped and was tight around his neck/mouth making it impossible for him to eat and drink. He had been gone for days and was not in good condition. Poor thing 😦 Never put a collar on a cat since then.